Sarcopenia is commonly associated with poor prognosis in prostate cancer. The objective of this study is to determine the correlation between sarcopenia and overall survival (OS) in patients with prostate cancer with metastatic debut (MPC) treated with androgen-deprivation therapy (ADT). Methods: From January 2008 to December 2015 a retrospective study was performed. The Hounsfield Unit Average (HUAC) of the psoas muscle, a marker of muscle density, was measured on the TC scan at the level of the third lumbar vertebra. A total of 70 MPC patients were included in the study. Median age was 74 +/- 9.28 years . Median PSA at diagnosis was 68.25ng/ml and 92.8% had a Gleason ≥ 8. 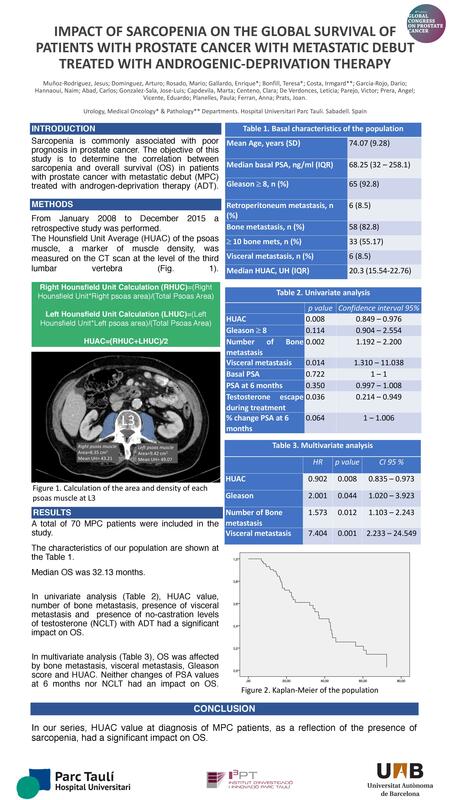 Six patients (8.5%) presented retroperitoneal metastases, 58(82.8%) bone metastases (BM) and 6 (8.5%) visceral metastases (VM). Median OS was 32.13 months. Median HUAC value was 20.3 UH. In univariate analysis, HUAC value, number of BM, presence of VM and presence of no-castration levels of testosterone (NCLT) with ADT had a significant impact on OS. In multivariate analysis, OS was affected by BM (hazard ratio (HR) 1.573, 95% CI 1.103-2.43; p=0.012), VM (HR 7.404, 2.233-24.549; p=0.001), Gleason score (HR 2.001, 1.020-3.923; p=0.044) and HUAC (HR 0.902, 0.835-0.973, p=0.008). Neither changes of PSA values at 6 months nor NCLT had an impact on OS. Conclusions: In our series, HUAC value at diagnosis of MPC patients, as a reflection of the presence of sarcopenia, had a significant impact on OS.